It's only their second album, but Asylum Pyre has made a monster CD with AOR rock songs that will go right home even with the hardest rock fan. 10 songs, mostly symphonic AOR that has melodic smile during the songwriting, hard and soft thrilling music. Their first album Natural Instincts from 2009 was a success, but this album will be much bigger. Singer Chaos Heidi is not exactly making chaos, but has a very beautiful voice which is perfect for these kind of songs. The Frozen Will gets the listener a hard and symphonic metal that fits perfect in any closet. These Trees is more melodic hard rock, but still in the bloodstream of the Asylum Pyre sound. The Herd is a super symphonic metal song which has both great guitar play and keyboards to supply the sound. Any Hypothesis gives us hard metal in the most melodic symphonic frame they can produce, fantastic hit potential. 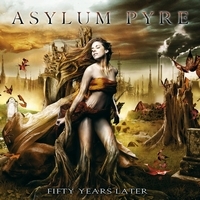 The title song Fifty Years Later is a unique soft symphonic metal hymn, well worthy of having the title song of this album. Here is an album that you can listen to again and again and not getting tired of it.